There are about 350 different termite species in Australia and most of these are grass eaters. Termites, also known as ‘white ants’ are not ants but are related to cockroaches. There are three types of timber eating termites found in Queensland- dampwood termites, drywood termites and subterranean termites. It is essential if termites are found on a property to get a Consultant to identify the termite species. Many termites found in trees, for example, will not attack buildings or other dry timber structures. Dampwood termites attack sick or dead trees, decaying stumps and mouldy timber in the ground. They are seldom found in dry timbers in buildings. They form small independent nests. Drywood termites occur mostly in tropical areas where the atmospheric humidity is constantly above 75%. West Indian termites ( Cryptotermes brevis ) were first recorded in Maryborough in 1964 and have since been found in Maryborough, Childers, Bundaberg and Brisbane. Specialist eradication procedures involve wrapping the entire building in plastic and using methyl bromide fumigation. Subterranean termites are the serious pest species involved in major timber damage to buildings. Subterranean termites cause about 99% of structural timber pest damage to homes in Queensland. Subterranean termites build a central nest from which they make use of underground tunnels to randomly forage for a timber (cellulose ) source within 75 metres of the nest. If they make contact with a hard object such as a brick pier or concrete slab flooring they build mud shelter tubes up and around the object. The mud shelter tubes protect them from ants and other enemies and prevents dehydration as high humidity is essential for their survival. Subterranean termites build a central nest often containing over 1 million termites and have an extremely well ordered social system with engineering capabilities and a survival instinct developed over 200 million years. They grow fungi in their nests as a protein source and the workers obtain cellulose as the colony’s energy source. They obtain moisture from the soil and moist decaying timber. The temperature in the nest is maintained between 28- 35C. Coptotermes acinaciformis – found all over Australia and causes more than 85% of all damage to Queensland buildings south of the Tropic of Capricorn- a single colony may consist of more than 1 million termites. They build their nests within the base of trees, under slabs ( ideal for moisture retention ) or within enclosed patios etc. This species also may set up a sub nest away from the main colony. Schedorhinotermes intermedius – found mainly in coastal regions and capable of causing major damage to timber framed buildings, especially pine. They build their nests in tree stumps and under houses and enclosed patios. Nasutitermes walkeri – found mainly in coastal regions. Capable of causing damage to timber in service. Nests are arboreal ( above ground in trees ) with part of the nest being within the tree. Heterotermes Spp . – usually attacks rotting timber in direct contact with the ground, like fencing or fallen timber. This species has been known to cause little damage to timber in service. Nests are small near the food source. Within the termite nest there are members of different casts, each with a role to perform. These include the queen, king, winged reproductives ( future queens and kings ), soldiers and workers. Workers – by far the largest cast in the colony and the one that does the damage. They are a creamy translucent colour, soft bodied and carry out all the work in the nest, including gathering food ( partly digested timber ), growing fungi within the nest ( protein source ), constructing tunnels, repairing and enlarging the nest, feeding the soldiers, king and queen and also caring for and feeding the young nymphs until they mature. The workers are blind and sterile, work 24 hours a day and live for up to 7 years. Soldiers – have pincers ( mandibles ) which they use to crush an attacker, such as ants. Some have hard snouts and they are usually the first to be encountered if the workings are disturbed. The soldiers rush out to guard the opening whilst the workers repair the damage. Winged reproductives – ( alates ) are commonly seen when they swarm usually on hot summer afternoons, or before and after rain. They eyes, but are poor flyers – they land, drop their wings, find a mate and set up as king and queen of a new colony. Queen – Following her hazardous flight and after mating she becomes an egg laying machine. Her body becomes hugely enlarged. She can live for more than 25 years producing more than 2,000 eggs a day. With the king, she lives in a central chamber where both are attended to by workers. Schedorhinotermes intermedius An often encountered termite throughout Australia. A destructive species which nest in trees and wood in the ground, particularly untreated landscape materials from which it can attack timber in buildings. It is responsible for 5% – 10% of the damage to timber in service. Coptotermes acinaciformis The most often encountered pest termite throughout Australia and one of the most destructive. It causes the most economic damage. It make its colonies in trees, tree stumps and wood in the ground. A mature colony can contain over 1 million individuals which would include the queen, king, workers, soldiers and alates. Heterotermes spp . This genus is found throughout most of Australia. Not generally considered as a major economic species, it is found more and more in urban locations attacking homes particularly in the more northern areas of the country. 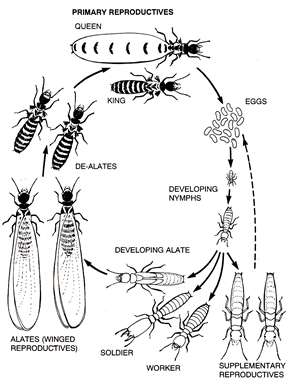 Colony size is usually small and Heterotermes often occur with other termites, particularly mound builders. Microcerotermes spp . This genus is mostly found in coastal Queensland. It builds arboreal nests, nests on posts and poles, also nests underground. Not generally considered as a major threat to timber in service. Nasutitermes spp . Some species damage timber in service while others feed only on decaying wood. Most species, however, are grass and debris feeders. It is mostly found in coastal eastern Australia from Sydney to Cairns. It mainly nests in trees and it’s nests may be aboundant in a comparitively small area. The two main timber destroying borers are furniture beetle and powder post beetle. Furniture beetle – ( Anobium punctatum ) The most common insect attacking some construction timber and older furniture. The common furniture beetle will attack all softwoods and some European hardwoods. Damage is found typically around floorboards, ceiling battens, timbers in contact with solid walls and under stairs. A severe infestation often relates to damp. Tunnels are between 1-2 mm and damage can be very extensive. Powder post beetle – ( Lyctus bruneus ) Found worldwide, this insect attacks the sapwood of hardwoods. Damage usually starts prior to the delivery of timbers to the site and can continue after being incorporating in the building. Tunnels are between 1.5 and 2 mm in diameter and are of random orientation, mostly parallel to the grain.